This past week I made my annual pilgrimage to recharge my soul at the Ontario Nature Youth Summit. It was my privilege to be invited to workshop at the first Summit held at Cedar Glen YMCA four years ago. Now utilizing the incomparable Geneva Park YMCA site on Lake Simcoe, the Ontario Nature staff continue to bring together an increasing number of intelligent, passionate, and environmentally literate young leaders from across the province of Ontario to protect and conserve our incredible planet. I must be doing something right, because they keep inviting me back. These are not the inspirational keynotes of old, but a simple opportunity to be children in the woods once again. We walk through the meadows and forests of whatever site is hosting us, and celebrate the wonder and mystery of the natural world, including ourselves. Then we take home the challenge – what next? What do I do in my own life to use my voice, with my own passion, to pay back the gift of being lucky enough to live and learn in Canada. But for a roll of the dice, every participant is keenly aware, they could have been born a young girl in Afghanistan with a totally different future. I think I am for them the living proof of the old Barry Lopez adage: that sometimes it takes someone much older and wiser to affirm for children, without a word being spoken, what a deep fierce pride we can take in all is, this celebration of life that is all around us, and that we can grow old knowing that it will never be lost. Two decades ago I had a children's story published about a frog and a snake who just wanted to be friends – it is a wonderful old West African folktale that Annick Press published as In the Great Meadow. As we explored our environment, one student walked in from the meadow with a leopard frog perched in the palm of her hand. Another approached from the other side with a garter snake coiled in her hand. They held their hands together and the frog and snake nestled in beside each other. "You make a wish and I'll make a wish too, and may your wish and my wish both come true." I can now grow old, knowing that this will never be lost. I did another little canoe solo this week and returned to my favourite campsite to keep a promise. My wife was busy at work, my youngest son was off to high school, and I was free to take the path of the paddle again. This week, the lake was quiet with only the occasional fisherman trolling by slowly. The week before I had to deal with the regular end-of-summer folk buzzing the lake with skiboats and wakeboarders and the insidious "personal water craft" that have allowed a motorcycle gang mentality to take over summer waterways. Add alcohol to the mix and you have stupid people on powerful machines just waiting for an accident to happen or a campsite to trash. On the other hand that week, I met a wonderful family from Oakville – Ed and Sheila and their children and dog – who had motor boated in to the campsite opposite mine and were having a hearty week of family camping. I paddled over to their site to say hello and ask them about the condition of their campground. They were delighted that I was cleaning up the other site, they had tried to do the same with theirs, and we ended up talking about everything under the sun – responsible camping, values and ethics, climate change, school, and even dog training. We had established a camping community of like minds, they in their motorboat and me in my canoe. All good. Then on the way out, I stopped at my favourite truck stop near Waubaushene, topped off my Prius, and sat down for a coffee. The woman serving me had noticed my canoe and was suitably impressed (Chester IS special). When I told her where I had been camping and cleaning up, she gave me a big smile and said, "I got married there. In February. We walked across the ice to the rock shelf above the second pool." Now that is truly a small world. My wife and I were also married in the great outdoors. It turned out that Wendy had been born in Atlanta, moved to Missouri, and vacationed every summer on our northern Ontario lake, eventually moving up to live here permanently. Although the man she married had lived all his life on that lake, they didn't meet until she was in her thirties as fate would have it. We chatted on for several minutes, another like mind who loved canoes, cottages, and clean campsites. 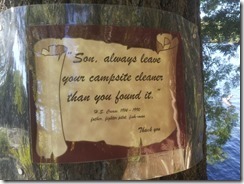 I promised Wendy I was coming back to finish the job and to post a notice to future campers. It was a promise I was keeping both to all those who lived in and loved our northern lakes and sacred spaces, and to my father. From my youth until his passing, we went fishing and camping often during the summer. From Georgian Bay to Rice Lake to Temagami, we fished and camped our way to an unbreakable father and son bond. Whenever we left a campsite, he would make a final walkabout, ensuring that the fire was dead out and that a little pile of sheltered kindling was tucked away discreetly for the next camper. 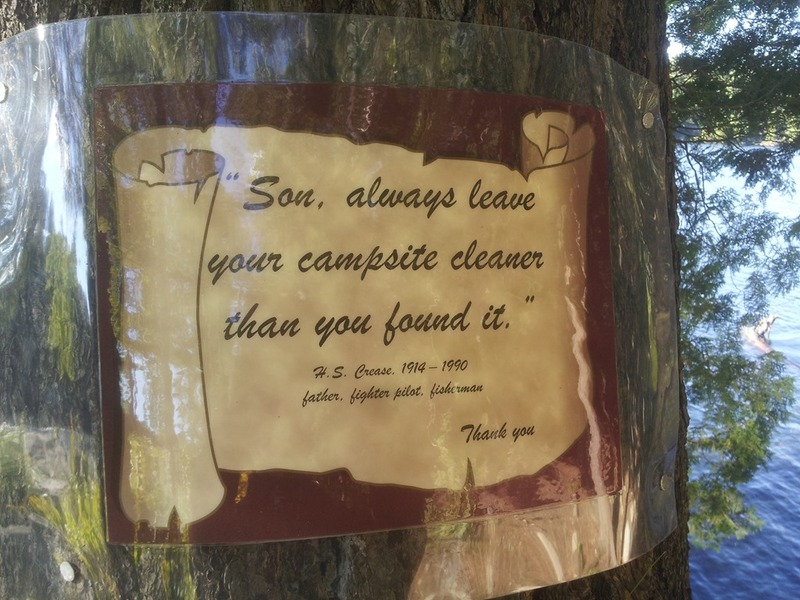 Then he would turn to me and say, "Son, always leave your campsite cleaner than you found it." I put that saying up in a small sign on "my campsite" yesterday. Then I canoed down the channel and cleaned up three more. An endless quest along the path of the paddle. Thanks, Dad, for giving my retirement a purpose. I have promises to keep, and miles to go before I sleep.